We’re not foreign to bars and restaurants with obscure origin stories in Hong Kong. Take Sheung Wan’s Mrs Pound, where the concept revolves around a mysterious burlesque dancer, or Central’s Foxglove, which is designed around the legend of Frank, a jetsetter from the 60s. But these colourful concepts aren’t unique to our city. 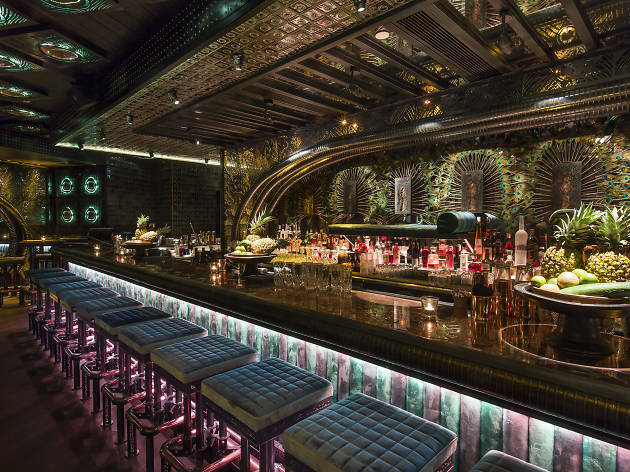 F&B design maestro Ashley Sutton proves this with creations like Iron Fairies and Maggie Choo’s in Bangkok – the former being based on a fairy tale written by Sutton himself and the latter being a bar that’s supposed to be the secret vault of the notorious East India Company. The success of his quirky concepts is evidenced by the expansion of these enterprises into Tokyo and New York. And now Sutton has landed in the fragrant harbour. The newly opened The Avenue plaza in Wan Chai to be exact. Located on the first floor, next to the Blue Brick Bistro’s dining room, Ophelia is supposedly the name of a peacock that Mr Wong – a rare bird collector – received as a gift. In case you wonder who the old man sitting by the door is, well, that’s Mr Wong. And elaborate is an understatement here when it comes to the ambience as, in every single decoration, the colours and the lights revolve around the theme of the peacock. In fact, the effect of the dim lighting, the beaded curtains and the waiters, who are adorned in traditional cheong sams, gives off a sort-of high-end opium den atmosphere. And it works. Ophelia looks as proud as a peacock. 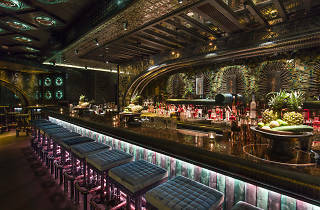 Exotic names such as the Jewelled Wing and the Jade Cat populate the drinks menu. We opt for the intriguing Fractal Barbie ($120), a mix of bourbon with rhubarb and rose petal soda. It’s floral to say the least. The hint of tartness from the stalk vegetable accentuates the woody tones of the bourbon. This concoction is a feather in Ophelia’s cap. Next we select the poetically named The Rime of the Ancient Mariner ($155) and it comes as dark as its name. The mix of three types of rum, which includes El Dorado eight-year, Blackwell Jamaican and Bacardi with grapefruit and lime juice, results in a drink that’s dark, bitter and has a full set of teeth. It isn’t an easy cocktail to down on its own but combines surprisingly well with the grease from the chilli whole school prawns with Szechuan salt and nam phrik sauce ($90). A night at Ophelia is quite an experience. So much attention has been paid by Sutton and his team to the interiors that guests can’t help but feel special and part of a wonderful story. We really hope Hong Kong takes to this bar’s luxurious cocktails and elaborate style because, if it’s a success, we just can’t wait for Sutton’s next epic tale.